Na Na Hey Hey Kiss Him Goodbye" is a song written and recorded by Paul Leka, Gary DeCarlo and Dale Frashuer, attributed to a then-fictitious band they named "Steam". It was released under the Mercury subsidiary label Fontana and became a number one pop single on the Billboard Hot 100 in late 1969, and remained on the charts in early 1970. The song's chorus remains well-known, and is frequently used as a crowd chant at many sporting events. Paul Leka, Gary DeCarlo and Dale Frashuer wrote a primitive version of the song in the early 1960s when they were members of a band from Bridgeport, Connecticut, called The Chateaus. The Chateaus disbanded after several failed recordings. In 1968, DeCarlo recorded several singles at Mercury Records in New York with Paul Leka as producer. The singles impressed the company's executives, who wanted to issue all of them as A-side singles. In need of "inferior" B-side songs, Leka and DeCarlo resurrected an old song from their days as the Chateaus, "Kiss Him Goodbye", with their old bandmate, Dale Frashuer. With DeCarlo as lead vocalist, the three musicians recorded the song in one recording session. Instead of using a full band, Leka had engineer Warren Dewey splice together a drum track from one of DeCarlo's four singles and played keyboards himself. "I said we should put a chorus to it (to make it longer)," Leka told Fred Bronson in The Billboard Book of Number One Hits. "I started writing while I was sitting at the piano going 'na, na, na, na, na, na, na, na'... Everything was 'na na' when you didn't have a lyric." Someone else added "hey hey". On page 87 of Uncle John's Fifth Bathroom Reader, the article titled One-Hit Wonders states that Gary DeCarlo recorded his first single for Mercury Records and was recording a throwaway "flip side"-something so bad, no DJ would accidentally play it as the "A" side. It was described as "an embarrassing record...an insult." Mercury Records decided it was great and planned to release it as a single. 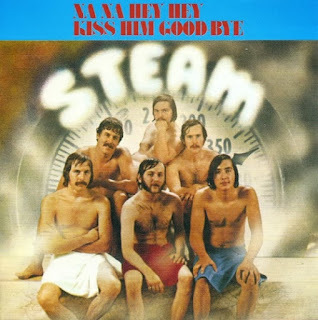 Nobody wanted to be identified with the record, so it was credited to "Steam". "Na Na Hey Hey Kiss Him Goodbye" reached number one in the United States for two weeks, on December 6 and 13 of 1969; it was Billboard's final multi-week #1 hit of the 1960s and also peaked at number twenty on the soul chart. By the beginning of the 21st century, sales of "Na Na Hey Hey Kiss Him Goodbye" had exceeded 6.5 million records. In 1970, Italian saxophone player Fausto Papetti recorded an instrumental version of the song, included in the album 11? Raccolta. The same year, the Lebanon-born singer Patrick Samson made his Italian version, but with the original English title. Bananarama. This was the fifth single released from their first album in 1983. It peaked at number five in the UK singles chart.